The danger rating continues to be MODERATE above treeline for the persistent weak layer around the December drizzle crust. We've had a number of small, low volume avalanches on this layer in the last week. As the weather has not contributed to instability in the last few days, the avalanche likelihood is slowly decreasing. The weak layer above the crust continues to show signs of poor strength and a tendency to propagate. Somebody traveling in the wrong place may still pop a slab avalanche. The photo below illustrates the full depth (31 inches) of the snowpack at 2000 ft. The most pertinent result from the test was the failure above the crust, which propagated in an extended column test. 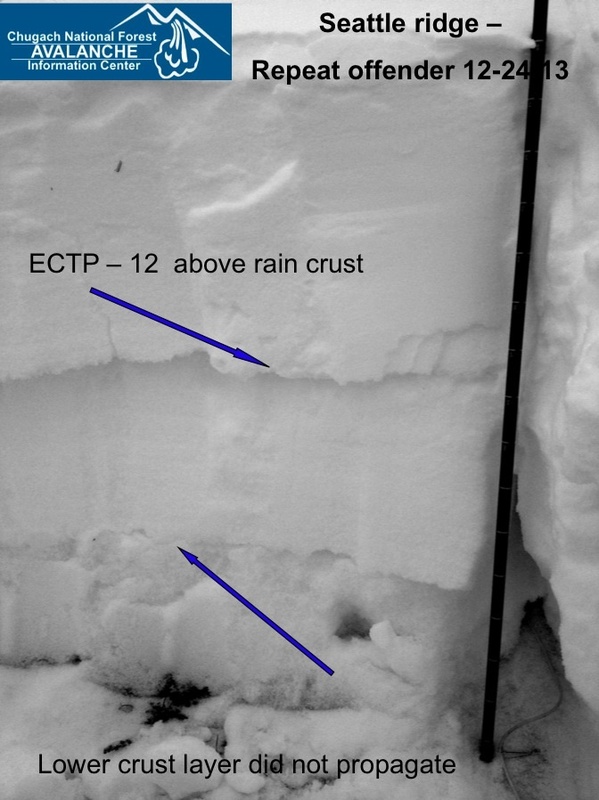 The snowpack is showing moderate strength, with poor structure and a slick crust interface. As recently as yesterday we got a report of whoomphing from the Tincan area. This tells us that a person can still initiate a collapse. A collapse occurring on a steep slope may trigger an avalanche. Spontaneous, natural avalanches were observed during the windy conditions on Monday. We know that areas near ridgetops, above treeline are still holding pockets of stiff wind slab from that wind event. As is normal, a little more caution is warranted when approaching ridgelines where wind blown snow will be expected. The denser and stiffer layers near the snow surface complete the recipe for the most probable way to find an avalanche today. It has not snowed since Sunday. Weather over the last few days has been clear and cold with light wind. A temperature inversion can be found in some areas. It is quite a bit warmer than Anchorage this morning. Sunburst sits at 23 degrees, Center ridge at 18, and Seattle ridge at 25 degrees. Wind at the ridgetops is very light. Mostly clear skies are expected today with patchy fog in the valleys.